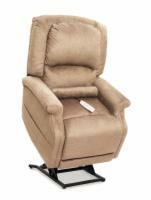 The Comforter PR-501M-26D is a dual-motor version of Golden's best selling and best all-around performing lift chair. 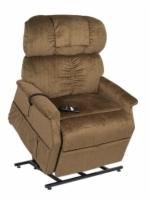 It combines a tried and true three-position lift mechanism with ultra-plush seat and back pillows, a reinforced hardwood frame, and a removable back. Every Comforter also comes with a 7-year pro-rated warranty and can be ordered with premium Ultra Fabrics. Best Feature: A 500-pound weight capacity makes the PR-501M-26D a good alternative to the standard PR-501M for a heavier-than-average user. Our Recommendation: This is our favorite Golden lift chair for the heavyset mid-level lift chair user. It is ideal if you plan on spending quite a bit of time using your chair, but don't require a chair that reclines to a full sleeper position. If you have additional questions that this product description doesn't answer, feel free to contact a lift chair expert for answers.